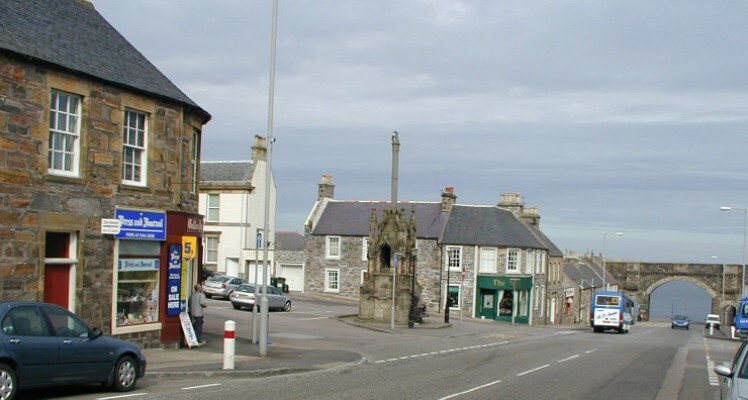 Cullen High Street @ High.St - High Street shops and High St businesses. Large Google map of Cullen High St.
Cullen is a small historic town on the A98 coast road. It has its own bay that is spectacular for its sandy beaches and the rising cliffs. The rugged skerries and coves have been carved out by the sea working out on the Grampian rocks; in places exposing the sparkling quartzite. The unspoilt area is surrounded by many woodland walks and wildlife, from seabirds to red squirrels. You may even catch sight of the Moray Firth dolphins if you're lucky. The viaduct through the town follows the route of the old railway and adds to the majestic nature of the area. Cullen ice cream is famous across Scotland for being the best - delicious! Detailed maps and information from RPA Smith Street Maps web site.